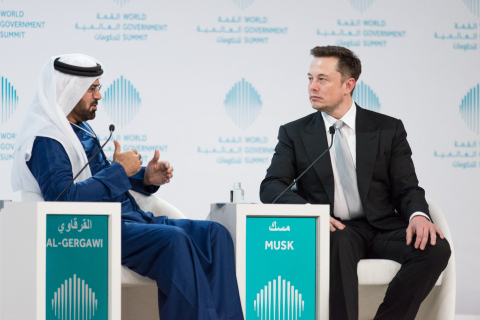 DUBAI, United Arab Emirates--(BUSINESS WIRE)--The future of transportation, specifically the impending arrival of autonomous cars, was a major topic at the second day of the 5th annual World Government Summit attended by 4,000 global leaders from 139 countries in Dubai. Prior to the session with Musk, Mattar Al Tayer, Chairman of the Roads and Transport Authority announced that human carrying drones are expected to be introduced into service within the public transport system by July 2017. Climate change and food security were also key themes of the day. Prime Minister of Bhutan highlighted that “1/3 of our global food supply, worth US$2.6 trillion annually, is routinely wasted.” HRH Princess Haya spoke about international humanitarian crises and a UN report estimates that 50 million will be displaced due to desertification and climate change in the next 10 years. Transportation of the Future Discussed at World Government Summit in Dubai. Tesla CEO, Elon Musk and Uber CEO Travis Kalanick among speakers.